This is my 2013 Bull Elk taken at 317 yards. 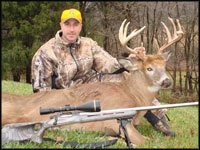 Hi Roger, I wish I could tell everyone how amazing the X Series muzzleloader really is. This photo is a 3 shot group at 100 yards. is amazingly accurate, I would recommend they get the Bad Bull X Series! 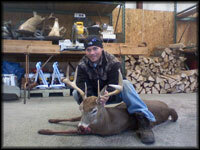 I have attached a couple of pictures of the 16 point buck I shot last week with my Bad Bull. 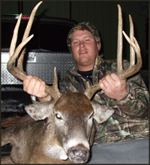 He had a preliminary score of 194 3/8" and could be the record for the county. This is the 3rd deer over 130" I have taken with my Bad Bull, all three were over 125 yards. None of my three trophies would I have shot at with my conventional muzzle loader. This was a once in a lifetime deer that I could not have taken without the bad bull. I just want to thank you once again for making such a great product that performs as advertised. You will probably be getting some orders for your gun from the Maryland area, everyone that wants to see the deer also want to see the gun. As I tell everyone, the gun is expensive but worth it. Please feel free to use the pictures. 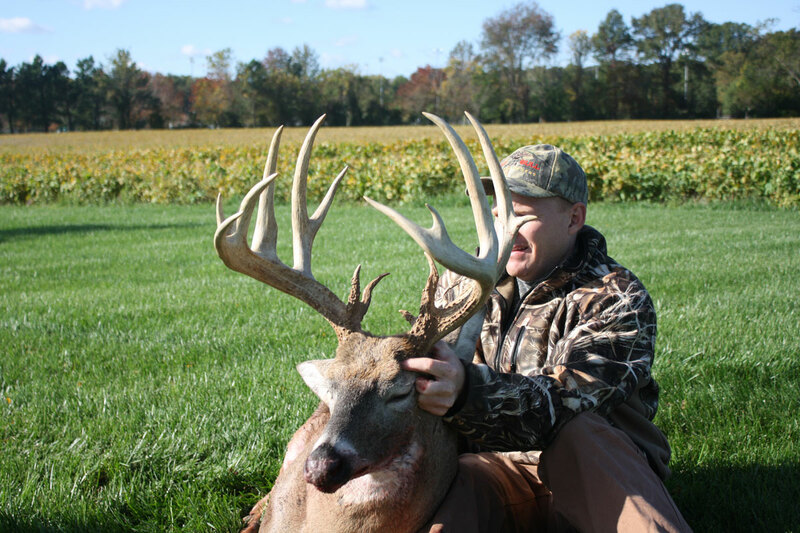 Thanks for building a muzzleloader capable of shooting this monster 151 inch 8 point at 336 yards. What an amazing weapon, he didnt go 5 steps! 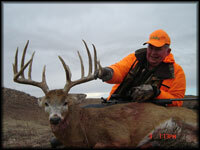 My dad also shot one with it at 100 yards, a 166 inch 11 point dropped in its tracks. Thanks again! 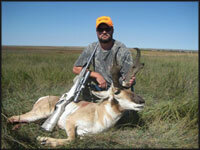 Here is the Antelope I shot yesterday with my Bad Bull Muzzleloader. We will have to wait 60 days for the drying period to get an official score, but he is a potential new Kansas State Record Antelope ever killed. I want to thank you Roger for making the best muzzleloader on the market. Dropped this buck at 90 yds. He had to be dead before he hit the ground. I pulled the trigger and he just collapsed like he had a heart attack. My friends and I couldn't believe the damage that the bullet made. My 300mag. doesn't hit that hard. "Roger, The guys from Northwest Indiana want to thank you for the fine muzzleloading rifles that you're selling. The muzzleloaders make both of us very confident when we are in the woods or open fields. 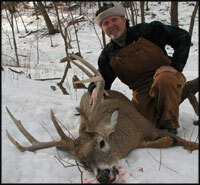 This deer was taken 11/28/08, 6:30 am at 120 yds in thick wooded cover." 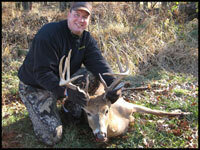 "Attached is a photo of the buck I shot on 11/23/2008. 150 yard shot at 8:45 a.m. 12 point buck with a 22 inch spread and field dresses at 220 lbs. Buck taken in San Piere Indiana. Thanks for the great product." Distance of travel - dead upon impact! I wanted to thank Roger Joyce for making me the badest muzzleloader in the world today. It performs flawlessly at the range shooting consistently at 300 yards. It is truly the most devastating and accurate muzzleloader on the planet as far as I'm concerned. I can't wait to do some doe management later on this year and try to stretch the Bad Bull out to 350 and maybe 400 yards. It's gonna be awesome!" 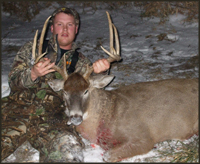 "I have attached a picture of a buck I killed in Illinois last week. He gross scored 177. I shot him at 185 yards with one shot from my new Bad Bull. Thanks for a great product and getting it to me by Nov 1st as promised!" This silver tip Grizzly was shot at 50 yards quartering towards me. I put the cross hairs of the Bad Bull Muzzleloader on his right shoulder. After firing the shot, the bear spun around in his tracks and went down as shown in the picture. He did not even twitch a muscle. We skinned the bear out. Part of the bullet was recovered under the skin on the opposite side and half way back along the ribs. After skinning, we removed the right shoulder. The bullet hit the large shoulder bone. We then opened up the chest and what I saw was the most damage that I had ever seen from one shot. There was a piece of bone the size of a man's finger that totally destroyed the lungs and heart. This was the best kill I had ever made in my hunting career. Here is another picture of the Bull Moose killed on the same hunt. The bull was shot at 40 yards through the shoulder. He dropped in his tracks. Also, there is a picture of a Bull Moose shot at 325 yards taken by my son. Again, the bull dropped in its tracks. 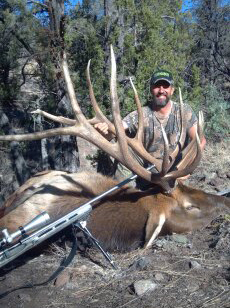 Included is a picture of a 6x6 Bull Elk at 400 yards killed with a Bad Bull Muzzleloader. 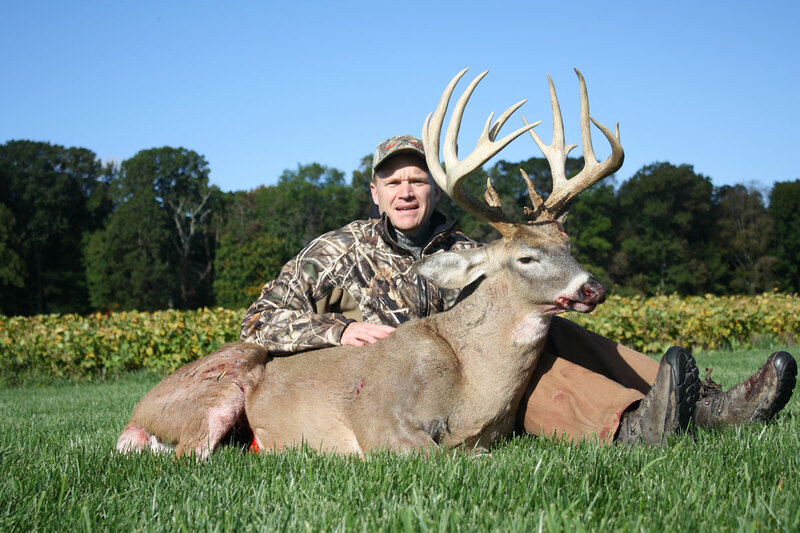 This muzzleloader has truly placed long-range muzzleloader shooting in the spotlight today. With the compensating custom scope, 600-yard muzzleloaders are here. You should be very proud that you have taken muzzleloaders to the 21st century and beyond. 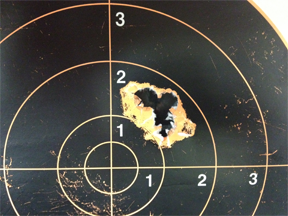 "Roger, Attached is a photo of the result of the first time I shot your gun. I am going to guess it was a 130-150 yard shot. Any way, one shot one kill, we still have seven days left and I hope to have the opportunity to send you another photo. Thanks and your Bad Bull Muzzleloaders Rock!" 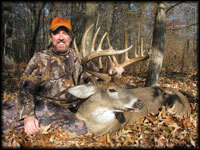 "I made 13 one shot kills on small to large whitetail deer at 20 to 200 yards. The most any went was 30 yards. Most went down on the spot or 2 or 3 steps backwards or sideways. Have never been so impressed!"